This article is for the current general availability version of the Azure Information Protection scanner. If you have an older version of the scanner installed, see Deploying previous versions of the Azure Information Protection scanner to automatically classify and protect files. If you are upgrading from a previous general availability version of the scanner to the current general availability version, see Upgrading the Azure Information Protection scanner. Use this information to learn about the Azure Information Protection scanner, and then how to successfully install, configure, and run it. Local folders on the Windows Server computer that runs the scanner. UNC paths for network shares that use the Server Message Block (SMB) protocol. Sites and libraries for SharePoint Server 2016 and SharePoint Server 2013. SharePoint 2010 is also supported for customers who have extended support for this version of SharePoint. To scan and label files on cloud repositories, use Cloud App Security instead of the scanner. The scanner can inspect any files that Windows can index, by using IFilters that are installed on the computer. Then, to determine if the files need labeling, the scanner uses the Office 365 built-in data loss prevention (DLP) sensitivity information types and pattern detection, or Office 365 regex patterns. Because the scanner uses the Azure Information Protection client, it can classify and protect the same file types. You can run the scanner in discovery mode only, where you use the reports to check what would happen if the files were labeled. Or, you can run the scanner to automatically apply the labels. You can also run the scanner to discover files that contain sensitive information types, without configuring labels for conditions that apply automatic classification. Note that the scanner does not discover and label in real time. It systematically crawls through files on data stores that you specify, and you can configure this cycle to run once, or repeatedly. You can specify which file types to scan, or exclude from scanning, by defining a file types list as part of the scanner configuration. Before you install the Azure Information Protection scanner, make sure that the following requirements are in place. - 10 GB free space (average) for temporary files Windows Server 2016 or Windows Server 2012 R2. Note: For testing or evaluation purposes in a non-production environment, you can use a Windows client operating system that is supported by the Azure Information Protection client. This computer can be a physical or virtual computer that has a fast and reliable network connection to the data stores to be scanned. The scanner requires sufficient disk space to create temporary files for each file that it scans, four files per core. The recommended disk space of 10 GB allows for 4 core processors scanning 16 files that each have a file size of 625 MB. Service account to run the scanner service In addition to running the scanner service on the Windows Server computer, this Windows account authenticates to Azure AD and downloads the Azure Information Protection policy. This account must be an Active Directory account and synchronized to Azure AD. If you cannot synchronize this account because of your organization policies, see the Deploying the scanner with alternative configurations section. - Log on locally user right assignment. This right is required for the installation and configuration of the scanner, but not for operation. You must grant this right to the service account but you can remove this right after you have confirmed that the scanner can discover, classify, and protect files. If granting this right even for a short period of time is not possible because of your organization policies, see the Deploying the scanner with alternative configurations section. - Log on as a service user right assignment. This right is automatically granted to the service account during the scanner installation and this right is required for the installation, configuration, and operation of the scanner. - Permissions to the data repositories: You must grant Read and Write permissions for scanning the files and then applying classification and protection to the files that meet the conditions in the Azure Information Protection policy. To run the scanner in discovery mode only, Read permission is sufficient. - For labels that reprotect or remove protection: To ensure that the scanner always has access to protected files, make this account a super user for the Azure Rights Management service, and ensure that the super user feature is enabled. For more information about the account requirements for applying protection, see Preparing users and groups for Azure Information Protection. In addition, if you have implemented onboarding controls for a phased deployment, make sure that this account is included in your onboarding controls you've configured. The Azure Information Protection scanner supports multiple configuration databases on the same SQL server instance when you specify a custom profile name for the scanner. When you install the scanner and your account has the Sysadmin role, the installation process automatically creates the scanner configuration database and grants the required db_owner role to the service account that runs the scanner. If you cannot be granted the Sysadmin role or your organization policies require databases to be created and configured manually, see the Deploying the scanner with alternative configurations section. The size of the configuration database will vary for each deployment but we recommend you allocate 500 MB for every 1,000,000 files that you want to scan. The Azure Information Protection client is installed on the Windows Server computer You must install the full client for the scanner. Do not install the client with just the PowerShell module. For client installation instructions, see the admin guide. If you have previously installed the scanner and now need to upgrade it to a later version, see Upgrading the Azure Information Protection scanner. Tip: You can use the instructions from the tutorial to test the scanner with a label that looks for credit card numbers in a prepared Word document. However, you will need to change the label configuration so that the option Select how this label is applied is set to Automatic, rather than Recommended. Then remove the label from the document (if it is applied) and copy the file to a data repository for the scanner. For quick testing, this could be a local folder on the scanner computer. - SharePoint 2010 Other versions of SharePoint are not supported for the scanner. For more information about supporting long file paths, see the Maximum Path Length Limitation section from the Windows 10 developer documentation. If you can't meet all the requirements in the table because they are prohibited by your organization policies, see the next section for alternatives. If all the requirements are met, go straight to configuring the scanner section. The scanner can accommodate these restrictions but they require additional configuration. Configure the scanner in the Azure portal, by creating a scanner profile. If you need help with this step, see Configure the scanner in the Azure portal. Export your scanner profile from the Azure Information Protection - Profiles (Preview) blade, by using the Export option. Finally, in a PowerShell session, run Import-AIPScannerConfiguration and specify the file that contains the exported settings. Note that in this configuration, the scanner cannot apply protection (or remove protection) by using your organization's cloud-based key. Instead, the scanner is limited to using labels that apply classification only, or protection that uses HYOK. If you can be granted the Sysadmin role temporarily to install the scanner, you can remove this role when the scanner installation is complete. When you use this configuration, the database is automatically created for you and the service account for the scanner is automatically granted the required permissions. However, the user account that configures the scanner requires the db_owner role for the scanner configuration database, and you must manually grant this role to the user account. If you do not specify your own profile name for the scanner, the configuration database is named AIPScanner_<computer_name>. If you specify your own profile name, the configuration database is named AIPScanner_<profile_name>. If your organization policies prohibit the Log on locally right for service accounts but allow the Log on as a batch job right, follow the instructions for Specify and use the Token parameter for Set-AIPAuthentication from the admin guide. For the scanner service account, you can use a local Windows account or an Active Directory account. For the Azure Active Directory account, follow the instructions for Specify and use the Token parameter for Set-AIPAuthentication from the admin guide. Before you install the scanner, or upgrade it from the general availability version of the scanner, create a profile for the scanner in the Azure portal. You configure the profile for scanner settings, and the data repositories to scan. Locate the Scanner menu options, and select Profiles. On the Add a new profile blade, specify a name for the scanner that is used to identify its configuration settings and data repositories to scan. For example, you might specify Europe to identify the geographical location of the data repositories that your scanner will cover. When you later install or upgrade the scanner, you will need to specify the same profile name. Optionally, specify a description for administrative purposes, to help you identify the scanner's profile name. Configure repositories: Do not configure at this time because the profile must first be saved. Now that the profile is created and saved, you're ready to return to the Configure repositories option to specify the data stores to be scanned. You can specify local folders, UNC paths, and SharePoint Server URLs for SharePoint on-premises sites and libraries. SharePoint Server 2016 and SharePoint Server 2013 are supported for SharePoint. SharePoint Server 2010 is also supported when you have extended support for this version of SharePoint. On the Repository blade, specify the path for the data repository. For the remaining settings on this blade, do not change them for this initial configuration, but keep them as Profile default. This means that the data repository inherits the settings from the scanner profile. If you want to add another data repository, repeat steps 7 and 8. You can now close the Add a new profile blade and you see your profile name displayed in the Azure Information Protection - Profiles blade, together with the SCHEDULE column showing Manual and the ENFORCE column is blank. You're now ready to install the scanner with the scanner profile that you've just created. Sign in to the Windows Server computer that will run the scanner. Use an account that has local administrator rights and that has permissions to write to the SQL Server master database. Open a Windows PowerShell session with the Run as an administrator option. When you are prompted, provide the credentials for the scanner service account (<domain\user name>) and password. Verify that the service is now installed by using Administrative Tools > Services. The installed service is named Azure Information Protection Scanner and is configured to run by using the scanner service account that you created. Now that you have installed the scanner, you need to get an Azure AD token for the scanner service account to authenticate, so that the scanner can run unattended. The Azure AD token lets the scanner service account authenticate to the Azure Information Protection service. Return to the Azure portal to create two Azure AD applications that are needed to specify an access token for authentication. After an initial interactive sign-in, this token lets the scanner run non-interactively. To create these applications, follow the instructions in How to label files non-interactively for Azure Information Protection from the admin guide. When prompted, specify the password for your service account credentials for Azure AD, and then click Accept. If your scanner service account cannot be granted the Log on locally right for the installation: Follow the instructions in the Specify and use the Token parameter for Set-AIPAuthentication section from the admin guide. The scanner now has a token to authenticate to Azure AD, which is valid for one year, two years, or never expires, according to your configuration of the Web app /API in Azure AD. When the token expires, you must repeat steps 1 and 2. You're now ready to run your first scan in discovery mode. From the Azure Information Protection - Nodes blade, the value for the STATUS column changes from Scanning to Idle. Using PowerShell, you can run Get-AIPScannerStatus to monitor the status change. Check the local Windows Applications and Services event log, Azure Information Protection. This log also reports when the scanner has finished scanning, with a summary of results. Look for the informational event ID 911.
Review the reports that are stored in %localappdata%\Microsoft\MSIP\Scanner\Reports. The .txt summary files include the time taken to scan, the number of scanned files, and how many files had a match for the information types. The .csv files have more details for each file. This folder stores up to 60 reports for each scanning cycle and all but the latest report is compressed to help minimize the required disk space. You can change the level of logging by using the ReportLevel parameter with Set-AIPScannerConfiguration, but you can't change the report folder location or name. Consider using a directory junction for the folder if you want to store the reports on a different volume or partition. With our setting of Policy only for Info types to be discovered, only files that meet the conditions you've configured for automatic classification are included in the detailed reports. If you don't see any labels applied, check your label configuration includes automatic rather than recommended classification. Scanners send this information to Azure Information Protection every five minutes, so that you can view the results in near real-time from the Azure portal. For more information, see Reporting for Azure Information Protection. If the results are not as you expect, you might need to reconfigure the conditions that you specified for you labels in your Azure Information Protection policy. If that's the case, repeat steps 1 through 3 until you are ready to change the configuration to apply the classification and optionally, protection. The Azure portal displays information about the last scan only. If you need to see the results of previous scans, return to the reports that are stored on the scanner computer, in the %localappdata%\Microsoft\MSIP\Scanner\Reports folder. When you're ready to automatically label the files that the scanner discovers, continue to the next procedure. Back on the Azure Information Protection - Profiles blade, select the scanner profile to edit it. There are other configuration settings that you might want to change. For example, whether file attributes are changed and whether the scanner can relabel files. Use the information popup help to learn more information about each configuration setting. Monitor the event log for the informational type 911 again, with a time stamp later than when you started the scan in the previous step. Then check the reports to see details of which files were labeled, what classification was applied to each file, and whether protection was applied to them. Or, use the Azure portal to more easily see this information. Because we configured the schedule to run continuously, when the scanner has worked its way through all the files, it automatically starts a new cycle so that any new and changed files are discovered. The scanner runs through the following processes when it scans files. The scanner automatically skips files that are excluded from classification and protection, such as executable files and system files. The scanner then uses filters to scan supported file types. These same filters are used by the operating system for Windows Search and indexing. Without any additional configuration, Windows IFilter is used to scan file types that are used by Word, Excel, PowerPoint, and for PDF documents and text files. For a full list of file types that are supported by default, and additional information how to configure existing filters that include .zip files and .tiff files, see File types supported for inspection. After inspection, these file types can be labeled by using the conditions that you specified for your labels. Or, if you're using discovery mode, these files can be reported to contain the conditions that you specified for your labels, or all known sensitive information types. If the label applies classification and not protection, and the file type does not support classification only. If the label applies classification and protection, but the scanner does not protect the file type. By default, the scanner protects only Office file types, and PDF files when they are protected by using the ISO standard for PDF encryption. Other file types can be protected when you edit the registry as described in a following section. For example, after inspecting files that have a file name extension of .txt, the scanner can't apply a label that's configured for classification but not protection, because the .txt file type doesn't support classification-only. If the label is configured for classification and protection, and the registry is edited for the .txt file type, the scanner can label the file. You might need to increase the number of dynamic ports for the operating system hosting the files. Server hardening for SharePoint can be one reason why the scanner exceeds the number of allowed network connections, and therefore stops. For more information about how to view the current port range and increase the range, see Settings that can be Modified to Improve Network Performance. For large SharePoint farms, you might need to increase the list view threshold (by default, 5,000). For more information, see the following SharePoint documentation: Manage large lists and libraries in SharePoint. For the file types that can't be inspected, the scanner applies the default label in the Azure Information Protection policy, or the default label that you configure for the scanner. By default, the scanner protects only Office file types, and PDF files when they are protected by using the ISO standard for PDF encryption. Other file types can be protected when you edit the registry as described next. The scanner has its own default behavior: Only Office file formats and PDF documents are protected by default. If the registry is not modified, any other file types will not be labeled or protected by the scanner. If you want the same default protection behavior of the Azure Information Protection client, where all files are automatically protected with native or generic protection: Specify the * wildcard as a registry key, and Default as the value data. When you edit the registry, manually create the MSIPC key and FileProtection key if they do not exist, as well as a key for each file name extension. For example, for the scanner to protect TIFF images in addition to Office files and PDFs, the registry after you have edited it, will look similar to the following picture. As an image file, TIFF files support native protection and the resulting file name extension is .ptiff. For a list of text and images file types that similarly support native protection but must be specified in the registry, see Supported file types for classification and protection from the admin guide. For files that don't support native protection, specify the file name extension as a new key, and PFile for generic protection. The resulting file name extension for the protected file is .pfile. For the first scan cycle, the scanner inspects all files in the configured data stores and then for subsequent scans, only new or modified files are inspected. Inspecting all files again is useful when you want the reports to include all files and this configuration choice is typically used when the scanner runs in discovery mode. When a full scan is complete, the scan type automatically changes to incremental so that for subsequent scans, only new or modified files are scanned. In addition, all files are inspected when the scanner downloads an Azure Information Protection policy that has new or changed conditions. The scanner refreshes the policy every hour, and when the service starts and the policy is older than one hour. If you need to refresh the policy sooner than this one hour interval, for example, during a testing period: Manually delete the policy file, Policy.msip from both %LocalAppData%\Microsoft\MSIP\Policy.msip and %LocalAppData%\Microsoft\MSIP\Scanner. Then restart the Azure Information Scanner service. If you changed protection settings in the policy, also wait 15 minutes from when you saved the protection settings before you restart the service. If the scanner downloaded a policy that had no automatic conditions configured, the copy of the policy file in the scanner folder does not update. In this scenario, you must delete the policy file, Policy.msip from both %LocalAppData%\Microsoft\MSIP\Policy.msip and %LocalAppData%\Microsoft\MSIP\Scanner before the scanner can use a newly downloaded policy file that has labels correctly figured for automatic conditions. For the data repositories that you've added to a scanner profile, you can use the Export and Import options to quickly make changes to the settings. For example, for your SharePoint data repositories, you want to add a new file type to exclude from scanning. Manually edit the file to make the change, and then use the Import option on the same blade. Apply a default label to all files in a data repository. For this configuration, set the Default label to Custom, and select the label to use. The contents of the files are not inspected and all files in the data repository are labeled according to the default label that you specify for the data repository or the scanner profile. Identify all custom conditions and known sensitive information types. For this configuration, set the Info types to be discovered to All. The scanner uses any custom conditions that you have specified for labels in the Azure Information Protection policy, and the list of information types that are available to specify for labels in the Azure Information Protection policy. This setting helps you find sensitive information that you might not realize you had, but at the expense of scanning rates for the scanner. The following quickstart for the general availability version of the scanner uses this configuration: Quickstart: Find what sensitive information you have. Use the following guidance to help you optimize the performance of the scanner. However, if your priority is the responsiveness of the scanner computer rather than the scanner performance, you can use an advanced client setting to limit the number of threads used by the scanner. For example, place the scanner computer in the same LAN, or (preferred) in the same network segment as the scanned data store. The quality of the network connection affects the scanner performance because to inspect the files, the scanner transfers the contents of the files to the computer running the scanner service. When you reduce (or eliminate) the number of network hops this data has to travel, you also reduce the load on your network. Inspecting the file contents, and encrypting and decrypting files are processor-intensive actions. Monitor typical scanning cycles for your specified data stores to identify whether a lack of processor resources is negatively affecting the scanner performance. If you have folders to scan on a Windows server, install the scanner on a different computer and configure those folders as network shares to scan. Separating the two functions of hosting files and scanning files means that the computing resources for these services are not competing with one another. If necessary, install multiple instances of the scanner. The Azure Information Protection scanner supports multiple configuration databases on the same SQL server instance when you specify a custom profile name for the scanner. Discovery mode typically has a higher scanning rate than enforce mode because discovery requires a single file read action, whereas enforce mode requires read and write actions. Your first scan cycle when the scanner must inspect every file will take longer than subsequent scan cycles that by default, inspect only new and changed files. However, if you change the conditions in the Azure Information Protection policy, all files are scanned again, as described in the preceding section. You can choose between Debug, Info, Error and Off for the scanner reports. Off results in the best performance; Debug considerably slows down the scanner and should be used only for troubleshooting. For more information, see the ReportLevel parameter for the Set-AIPScannerConfiguration cmdlet. Office files are more quickly scanned than PDF files. Unprotected files are quicker to scan than protected files. Large files obviously take longer to scan than small files. Confirm that the service account that runs the scanner has only the rights documented in the scanner prerequisites section, and then configure the advanced client property to disable the low integrity level for the scanner. The scanner runs more quickly when you use the alternative configuration to apply a default label to all files because the scanner does not inspect the file contents. The scanner runs more slowly when you use the alternative configuration to identify all custom conditions and known sensitive information types. Because you now configure the scanner from the Azure portal, cmdlets from previous versions that configured data repositories and the scanned file types list are now deprecated. The cmdlets that remain include cmdlets that install and upgrade the scanner, change the scanner configuration database and profile, change the local reporting level, and import configuration settings for a disconnected computer. Use the following sections to identify the possible event IDs and descriptions for the scanner. These events are logged on the server that runs the scanner service, in the Windows Applications and Services event log, Azure Information Protection. This event is logged when the scanner service is started and begins to scan for files in the data repositories that you specified. This event is logged when the scanner has finished a manual scan, or the scanner has finished a cycle for a continuous schedule. If the scanner was configured to run manually rather than continuously, to scan the files again, set the Schedule to Manual or Always in the scanner profile, and then restart the service. Interested in how the Core Services Engineering and Operations team in Microsoft implemented this scanner? Read the technical case study: Automating data protection with Azure Information Protection scanner. 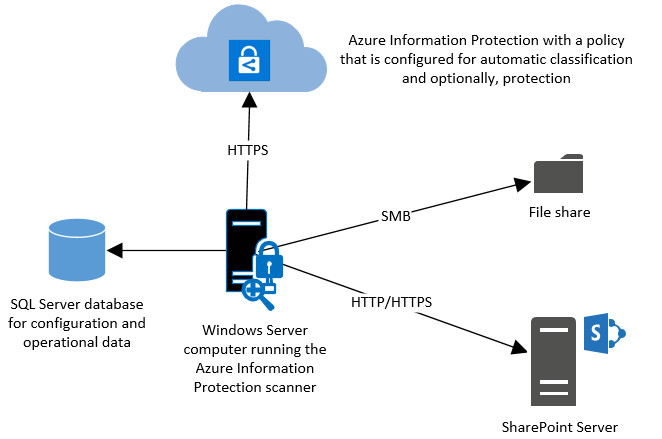 You might be wondering: What’s the difference between Windows Server FCI and the Azure Information Protection scanner? You can also use PowerShell to interactively classify and protect files from your desktop computer. For more information about this and other scenarios that use PowerShell, see Using PowerShell with the Azure Information Protection client.